Things I liked: Compact size and light weight. Clear optics and rugged design. Things I would have changed: Add a 2" sunshade as an option. What others should know: This scope has seen duty on several magnum .22 break barrels with no issues. Has finally found a home on my Xisico 46U .177 with tack driving results. Things I liked: Very good quality scope for under 100 bucks. Has the lighted reticle, mil dot and many extras that come with the scope itself. Things I would have changed: The flip cap for the front does not fit on the sunshade when it is installed on the scope. 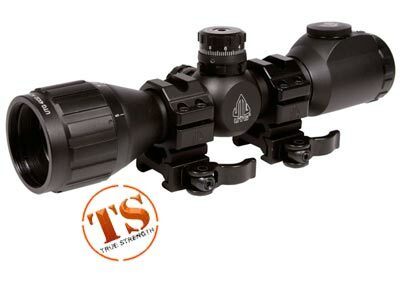 What others should know: Great scope for a great price in my opinion I like all the features from the AO,to the lighted reticle, and the W/E knobs with the locks. Everyone should have one of these scopes. Things I liked: LOVE LOVE LOVE this little scope on my Crosman Vantage Nitro Piston Air Rifle. Great combo. Things I liked: Everything about this scope is quality. The mounting system is the best, easy to install, easy to adjust. Things I would have changed: I was advised to get a fixed 4X, and I wish I got the variable. I didn't want the hassle of a return. Can't change my personality however! What others should know: I think this is a really nice scope. Since there are many choices in this price range, I'd advise you study all of them before you decide. Mine came with the sunshade in one of the boxes that looked like filler in the plastic case. I almost trashed it by mistake. Things I liked: Compact, very solid, clear optics. What others should know: This is a compact scope so it does not fit on all receivers. It does not fit the Leapers accushot 1 pc mount. Things I liked: Fantastic scope, 4x fixed mag, 32 or 36 colors, any color for any lighting situation. Comes with attachable lens caps and sun shade and perfect mount for the Benjamin pistol which has no sites. A little pricy but very nice optics and easy to zero.